Yesterday I had a nervous breakdown after going into my garden in the evening. I found so many of my plants somehow damaged or destroyed by rodents or bugs that I was sure I am done with organic gardening! (ok, I wasn't serious but I did feel pretty discouraged). Take a look at some of the damage. All of my big tomatoes that were fairly close to the ground were eaten like this (and more). I am not sure but I thought it could have been chipmunk. I don't think rabbits would enjoy tomatoes. Another veggie that fell a victim to a chipmunk (or I thought), was my yellow summer squash. 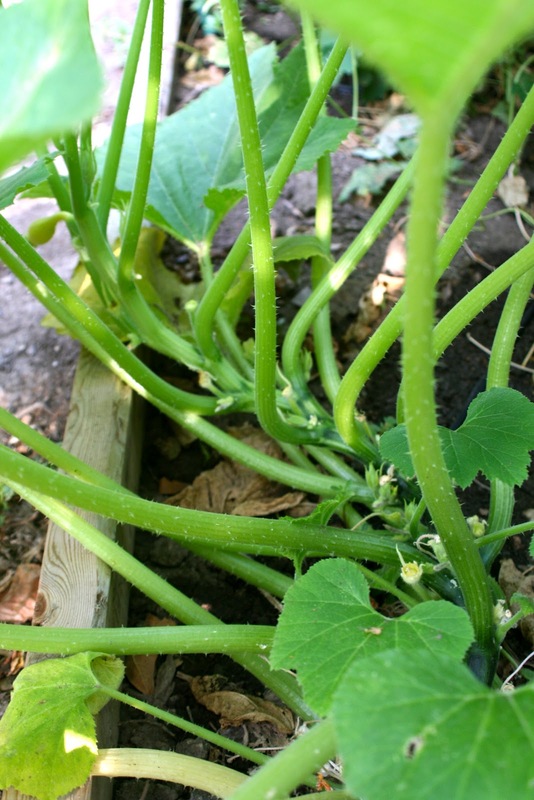 I would see a small squash and then the next day it would be chewed off together with some other buds. Here is an empty corner where I planted summer squash but I had to pull it out because it got squash vine borer. It is a white worm that crawls into the steam, near the roots, and the plant dies in only few days. I learned that if I would watch my plants daily and see the first signs, I could slice the steam, find the worm and remove it from the plant. Cover the cut steam with soil and water the area. That might help the plant to recover. I will try that next time. Bugs or caterpillars ate my spring veggies and beans as well. My friend Jen (whom you can visit here) told me about jar with soapy water that she keeps in the garden at all times. Instead of using bug spray, she just picks the insect of and puts them in the water. That has been pretty effective as well! Another crop that came under attack are my cucumbers. I had great start with bunch of crop, and all of a sudden the plants got wilted and died. After doing some research, I found out that we were attacked by Striped Cucumber Beatle, which causes them to get bacterial wilt. I saw tons of those bugs on my plants and so I knew right away that was what happened. I had to pull them all out and now I am walking around with my soapy water everyday. So far no more casualties! Also, if you have ear wigs or ants infestation, you can simply take black pepper you use in the kitchen and sprinkle it on the problem area. That took care of it immediately. Slugs will go for beer that you can place into a bowl and put that in your garden bed. It worked for me too. Things are looking up for me again. There was so much work put into my garden and now with the weather being so hot and dry, these rodents were just the thing to push me over the edge. Today was the first day I didn't have to water at all as we had a storm coming thru last night, into the morning.